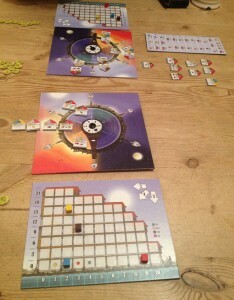 Le Havre: The Inland Port is a 2-player only game linked to the larger, original Le Havre game. I haven’t played the original Le Havre so will be reviewing this game on its own merits without comparisons. It’s a simple game with depth, but it’s also unusual so I shall explain how it plays. The Inland Port is played over 12 rounds and the winner is the player with the highest total value of cash and buildings (which each have an end-game value). 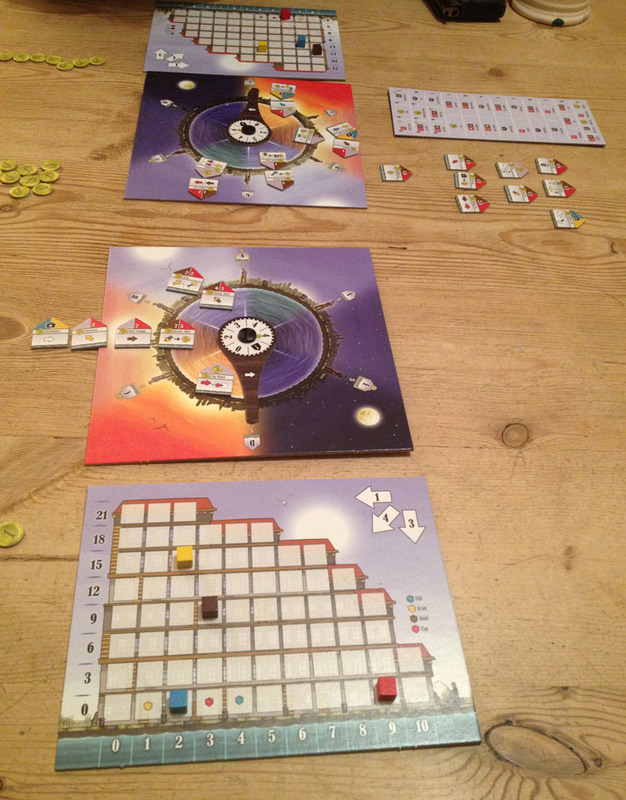 Each round consists of a fixed number of actions (3 actions to start increasing to 9 actions by game’s end) and players take turns taking 1 action to either buy or use 1 building. At the start of each round, some buildings are added to the market. Players each have two boards in front of them. One is their warehouse – a grid with 4 resource markers (clay, wood, grain, fish) where the total of each resource is the marker’s row number (multiples of three) plus the marker’s column number. When a player gains or loses resources, they move the markers in specific grid directions – this may sound unnecessary but is a clever system and I’ll explain why later.